The Dodd-Frank Act, a massive compilation of banking regulations enacted in 2010, was meant to prevent another financial crisis like 2008 by promoting a safer and fairer banking system. Obama called it the most significant financial reform since the 1930s. But the Trump administration wants to repeal the act. “The proponents of Dodd-Frank promised that it would lift our economy. Yet now, six years later, the American people remain stuck in the slowest, weakest, most tepid recovery since the Great Depression,” President-elect Donald Trump stated on his website. Trump’s pledge to dismantle the law was welcomed by banks, especially smaller ones that have been hurt most by the costs resulting from regulation. Since the election, financial stocks have rallied on the prospect of a strong economy and deregulation, outperforming the other sectors. 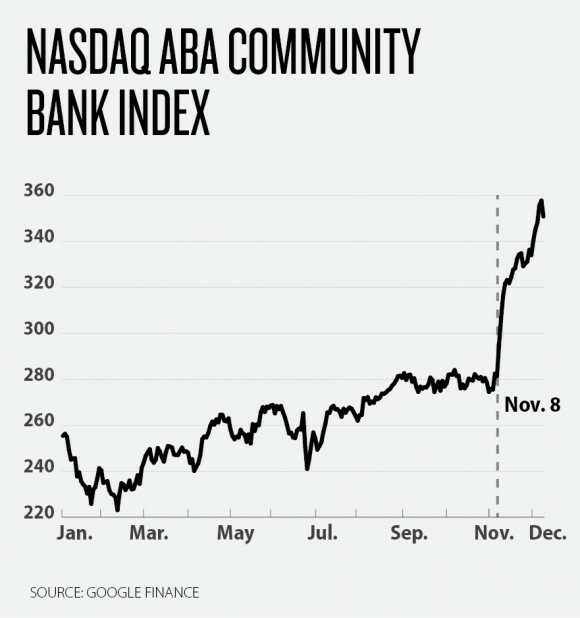 The Nasdaq Community Bank Index climbed 26 percent since Nov. 8. “We are delighted,” said Jay Sidhu, chairman and CEO of Customers Bank, a community bank headquartered in Wyomissing, Pennsylvania. “This administration is very focused on having sensible regulations,” he said, after attending Trump’s meeting with bankers on Dec 7. According to Sidhu, the new administration may not repeal the entire act, as some aspects of it are still necessary to avoid a new financial crisis. However, he thinks the rules that are costly and ineffective will be eliminated quickly. “We need regulations, we need regulators, but we don’t need overregulation,” he said. The legislation, which aimed to end the “too big to fail” mentality, has instead hurt small banks and consumers. The top five banks control nearly the same share of U.S. banking assets as they did before Dodd-Frank, according to a study published by the Harvard Kennedy School of Government in 2015. The same study showed that community banks (those with less than $10 billion in assets) suffered losses, with the smallest ones losing nearly 20 percent of their share of U.S. banking assets. These banks, however, lost their competitive advantage against the larger U.S. banks as the cost of regulation absorbed a big portion of their budgets. The new administration should first fix the act to ensure the survival of community banks, says Richard Parsons, author of “Broke: America’s Banking System” and a former banker who spent 31 years with Bank of America. “It is in my view a slam dunk that the Trump administration will address the burdens of community banks in the United States. That’s something that should have been done two Congresses ago,” he said. Increased regulatory demands and capital requirements increased banks’ costs, which were ultimately passed on to consumers. Regulations also reduced banking products and service offerings. It became harder for banks to serve small businesses profitably, stated Robert G. Wilmers, chairman and CEO of M&T Bank, in the company’s 2015 annual report. “While the economy as a whole appears to be expanding, small businesses, once a significant source of job creation and a leading indicator of the economy’s health, have not fully recovered from the recession,” he wrote. Consolidation among community banks accelerated after Congress passed the act. According to a survey by George Mason University, the number of community banks dropped 14 percent between 2010 and 2014 as a result of consolidations and bank failures. This drop has affected the banking jobs market as well. According to research by the American Action Forum (AAF), a right-leaning think tank, employment in small and regional banks has either declined or contracted. The same report, however, stated staff at the largest banks and financial regulatory agencies grew by double-digits. To reduce the risks at large financial institutions, banks had to increase their capital stock and reduce their leverage ratios. During his speech at Georgetown University on Dec. 5, Vice President Joe Biden responded to criticism and stressed the importance of keeping Dodd-Frank intact in a Trump administration. 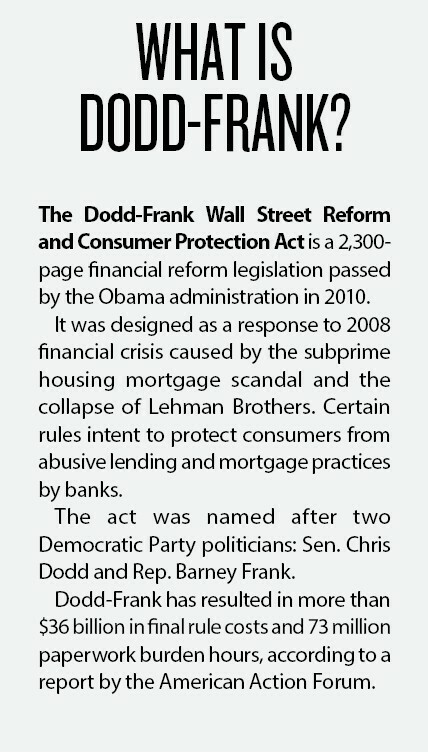 “Dodd-Frank was the centerpiece of our plan to stabilize the financial system and prevent a new crisis. The financial sector stabilized much more quickly than our critics thought it would, allowing American commerce to get back on its feet,” Biden said. Although banks are better capitalized today, the financial industry’s view of the legislation is entirely different. Industry experts argue that the act increased costs and affected the economy in negative ways. On the one hand, regulations are important for maintaining economic safety, according to Thomas Vartanian, a partner at law firm Dechert LLP. However, the breadth and depth of regulation need to be reevaluated to get the right balance to avoid financial disasters and economic dislocations in the long term, he said. Vartanian served as general counsel of the Federal Home Loan Bank Board and the Federal Savings and Loan Insurance Corporation under the Reagan administration. Some critics also say Dodd-Frank has failed to eliminate banks’ risky transactions. The Volcker Rule, a provision in the act, prohibits banks from engaging in proprietary trading and limits their relationships with hedge funds and other private funds. However, the five largest banks have an interdependent relationship with their hedge fund and private equity clients, according to Wilmers. These funds depend on large banks’ balance sheets to increase leverage and boost returns—and they pay hefty fees to large banks in return. The five largest banks are JPMorgan Chase, Wells Fargo, Bank of America, Citigroup, and U.S. Bancorp. A former banker and a senior executive at a private equity firm, who wished to remain anonymous, told Epoch Times that banks, hedge funds, and private equity firms are still using the products Dodd-Frank was supposed to eliminate and now create more complex structures to mask their activities. “They haven’t gone away; they’ve just gotten more complicated to circumvent the regulation. So they pay huge fees to lawyers and consultants to help structure these deals,” he said. According to Parsons, those claims could be true. “There are a lot of clever people [in financial institutions] constantly thinking of creative ways to solve problems,” he said. Anat Admati, professor of finance and economics at Stanford University, said the act is overly complex and its implementation is inadequate, thus maintaining a very dangerous and inefficient system. The devil is very much in the details, she said. Dodd-Frank is also criticized for adding layers of complexity to the spaghetti-like financial regulatory structure of the United States. “There is no question that the United States has the worst regulatory bank design in the world,” Parsons said. This problem may also be tackled by the new administration. “However, this is heavy lifting, and it would require some of the greatest thinking minds in the United States. But fixing it could have significant economic benefits in the long term,” said Parsons.